Not all exceptional photographers live rarefied lives, some toil in the vineyards and take spectacular pictures again and again and again. 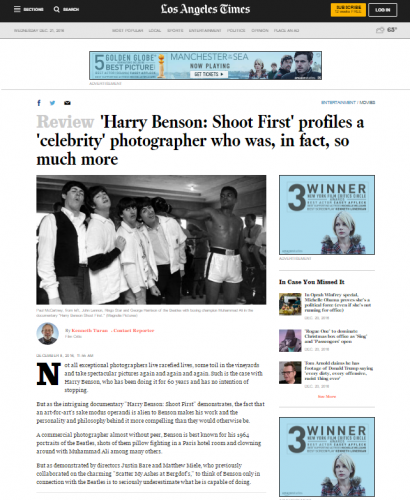 Such is the case with Harry Benson, who has been doing it for 60 years and has no intention of stopping. But as the intriguing documentary "Harry Benson: Shoot First" demonstrates, the fact that an art-for-art's sake modus operandi is alien to Benson makes his work and the personality and philosophy behind it more compelling than they would otherwise be. A commercial photographer almost without peer, Benson is best known for his 1964 portraits of the Beatles, shots of them pillow fighting in a Paris hotel room and clowning around with Muhammad Ali among many others. But as demonstrated by directors Justin Bare and Matthew Miele, who previously collaborated on the charming "Scatter My Ashes at Bergdof's," to think of Benson only in connection with the Beatles is to seriously underestimate what he is capable of doing.